Range of Miniature Load Cells from Lord Sensing Stellar Technology available from Rhopoint Components are of welded stainless steel design and feature high accuracy, shock and vibration resistance and are available in both compression and tension configurations. With various options in terms of load ranges, styles and sizes, these miniature load cells cover most industries where quality, stability and accuracy are of high importance, such as test & measurement, subsea, automotive, oil & gas, medical, defence and others. The design can be customised to your requirement with many selectable features and options - Contact us to discuss. The MIN800 miniature tension and compression load cell from Stellar Technology offers maximum load ranges of 100lbs, 250lbs, 500lbs and 1000lbs with accuracy of ±0.25% BFSL. The MIN800 series from Stellar Technology are general purpose load cells being compact sized for both tension and compression applications, these miniature load cells are designed to minimise the effects of off-axis loading. Constructed of all welded stainless steel and are also configured as through-hole load washers which makes these highly adaptable. The MIN802 miniature compression load cell from Stellar Technology offers maximum load ranges of 100lbs, 250lbs, 500lbs and 1000lbs with accuracy of ±0.25% BFSL. These compact-sized bonded foil strain gauged force sensors provide reliable performance for demanding application conditions. They are constructed of all welded stainless steel and have a machined load button that is an integral part of the sensing element. The MIN811 precision miniature tension and compression load cell from Stellar Technology offers maximum load ranges of 100lbs, 250lbs, 500lbs and 1000lbs with accuracy of ±0.15% BFSL. The MIN811 series from Stellar Technology are both high accuracy and compact sized for both tension and compression applications, these miniature load cells are designed to minimise the effects of off-axis loading. Constructed of all welded stainless steel, these devices come in a variety of mounting configurations with active male threads as standard. The MIN822 precision miniature compression load cell from Stellar Technology offers maximum load ranges of 100lbs, 250lbs, 500lbs and 1000lbs with accuracy of ±0.15% BFSL. These compact-sized bonded foil strain gauged force sensors provide reliable performance for demanding application conditions requiring higher accuracy. The MIN822 series from Stella Technology are constructed of all welded stainless steel and have a machined load button that is an integral part of the sensing element, available in a variety of mounting configurations. The MIN830 high capacity miniature compression load cell from Stellar Technology offers maximum load ranges from 10lbs to 30k lbs with an accuracy of ±0.5% BFSL. These compact-sized load cells are for general purpose compression load applications, the larger units are available with internal signal conditioning for analog (0-5 Vdc, 0-10 Vdc, 0.004-0.020A) and/or digital (RS232, RS485, CSNbus, MODbus) outputs. The MIN830 series from Stella Technology are constructed of all welded stainless steel and the bonded foil strain gauged force sensors, provide reliable performance for demanding applications. The MIN835 high capacity miniature tension and compression load cell from Stellar Technology offers maximum load ranges of 2k lbs, 3k lbs, 5k lbs, 7.5k lbs and 10k lbs with an accuracy of ±0.2% BFSL. Constructed of all welded stainless steel, these bonded foil strain gauged force sensors provide reliable performance for demanding applications and come in a variety of mounting configurations. The MIN835 series from Stellar Technology are ideal for high capacity applications where size constraints limit many load cell configurations. The MIN840 high accuracy miniature tension or compression load cell from Stellar Technology offers maximum load ranges of 250lbs, 500lbs, 1000lbs, 2500lbs and 5000lbs with an accuracy of ±0.15% BFSL. Constructed of all welded stainless steel, these bonded foil strain gauged force sensors provide reliable performance for demanding application environments and come in a variety of mounting configurations. The MIN835 series from Stellar Technology come with internal modules which provide high level analog or digital outputs. The MIN845 miniature compression load washer from Stellar Technology offers maximum load ranges from 2.5k lbs to 200k lbs with an accuracy of ±2% BFSL. 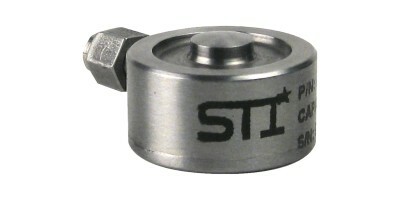 These miniature through-hole configurations are often used for measuring tension on fasteners. Constructed of stainless steel, these bonded foil strain gauge force sensors are available in a wide selection of both standard and special outside/inside diameters. The MIN845 series from Stellar Technology can be used with Stellar Technology's selection of in-line and DIN rail mount signal conditioners to provide current or voltage outputs.